In 1991, a friend and I traveled to Europe and - with a rail pass - visited the manufacturing plants of most of the major European automakers. This was a trip that we had anticipated for a long time. 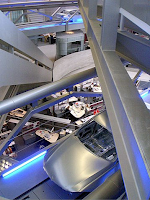 When I first saw the famous "4-cylinder" BMW HQ, I felt that I had seen a shrine to car lovers, it was amazing, but at the museum I could not help but feel that I was missing something - we were only getting to see half the process... just the end of the line. It was not until we made it to the factory that we saw the true shrine. I could have spent all day watching BMW's be born, but we had to go on to Porsche's facility. I could not have known at the time, 17 years ago, that that same emotion would be brought back today on a much more massive scale. 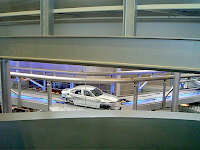 On October 17, 2007, BMW opened a landmark delivery facility in Munich, the BMW Welt (trans. "World"). At the Welt, which is right on the Oberwiesenfeld in Milbertshofen (i.e. at the Group Headquarters), a customer is treated to a visual feast as they take delivery of their BMW. This is the 4-Cylinder HQ times 10! The budget must have been unlimited, and the building is breathtaking. It is certainly the Ultimate Consumer Experience, but.....is it the Ultimate Driving Experience? "Its cavernous main hall is packed with restaurants, a cafe and a shop hawking BMW merchandise. Clients arriving at the main showroom to pick up their new cars are handed frothy cappuccinos and led into a small booth where they can try out the car’s special driving features by computer simulation. They then proceed down a grand staircase to a platform lined with BMW cars. As they approach the bottom of the staircase, spotlights light up underneath their car, which begins to rotate on a platform. A young woman sprints over to snap a picture." The issue with this $275 million "shrine" is the same that I felt with the museum back in 1991 - it leaves me feeling like I am seeing only a small part of the process. While a separate factory tour is part of the package when you travel to the Welt, I cannot help but wonder why they are not one in the same. For example, in 2005, the Zaha Hadid BMW factory in Leipzig was completed and it was the real deal (for $65 million). Here a customer could be treated to a real visual feast. If I were going to pick up my car, I would much prefer to do it from here. If the cappuccinos at the delivery were not bad enough, to make matters worse, on the Welt website, the company advertises how the process unfolds for the customer, and it is a visual feast .... (get ready).... of the customer sitting down with a dealer to negotiate an order. You almost have to shield your eyes. If this isn't the exact opposite of the Ultimate Driving Experience, then Ferrari is a minivan maker. I have been a BMW devotee (and owner) for a long time, but to me, the Welt is a $275 million excess. P.S. The friend that traveled with me to see the European car factories in 1991, is now on the Board of Local Motors! NSƯT Hoài Linh cũng viết lên trang cá nhân: “Tên của em (Mỹ Tâm - PV) đã nói lên điều đấy. Mùa đông không lạnh. Cám ơn em nhé gái ơi”. "Xem clip này, tôi đã khóc. Tôi khóc vì cô ấy là một ngôi sao lớn nhưng lại cực kỳ nhỏ bé, giản dị đứng trước mọi người. Tôi khóc vì Mỹ Tâm ko khoe khoang tôi là một ca sĩ, ngôi sao. Chỉ đơn thuần chị đấy giới thiệu về tên mình và cổ vũ các người khuyết tật và kêu gọi sự giúp đỡ và tài trợ giàn phơi quần áo giá rẻ. bao lăm đấy thôi cũng đủ khiến chúng ta ấm lòng giữa đêm đông”.